Hi, I'm Claire and I've been running Monkey Music since 2005. It all started when I wanted to find a music class for my children. That's when I discovered Monkey Music and I've never looked back! Every class is a joy to teach and I'm passionate about the benefits music brings to babies, young children and their families too. Music has always been a big part of my life. Coming from a large musical family, my home was a wonderful noisy musical place - and I hope my two children (both now noisy musicians themselves) would say the same. Growing up I went to music school every weekend – concentrating on clarinet, piano and vocal choral singing. The whole family was involved, and all Saturday was spent going from one group to another - full orchestra, wind band, choir, jazz band - we loved it. My working life wasn’t always musically minded though, I worked as a sales and marketing director for a big national event company before I became a mum. 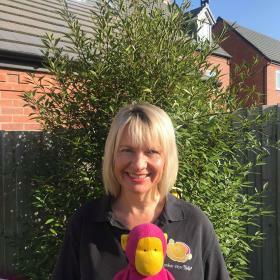 It was then that I set out to find a music class to take my children to near home in Stratford-upon-Avon – and when I failed to find one I came across Monkey Music and the possibility that I could become a franchisee. When they wanted me to prove my musicality before I could start, I knew that music was at the core of the business, and that Monkey Music was the class I had been searching for. I’m a huge believer in the benefits of an early introduction to music – even in the womb, studies show babies who are played different types of music are more settled. In babies and infants, greater exposure to music increases cell changes in the area of the brain concerned with speech too - and since music uses both sides of the brain, it boosts other areas as well, such as movement, creativity, spatial reasoning, memory and emotional intelligence. Our award-winning weekly music classes - for babies from 3 months to children of 4 years - are all about socialising in a stimulating environment. Established for well over a decade, we have venues across South Warwickshire. Our classes are all small and tailor made, grouped according to age. 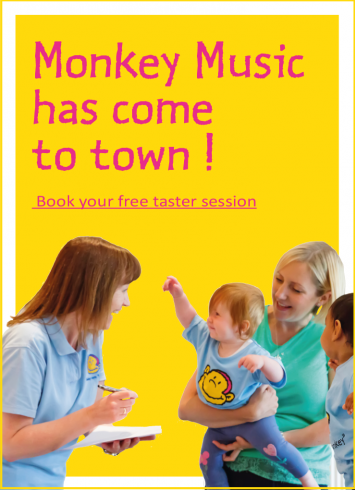 Babies from 3 months enjoy gentle songs and absorbing activities in Rock n Roll, toddlers get up on their feet and explore props in Heigh Ho, two and three-year-old learn to sing, dance and play instruments in Jiggety Jig, while our biggest monkeys learn to understand musical patterns and recognise notes in Ding Dong. 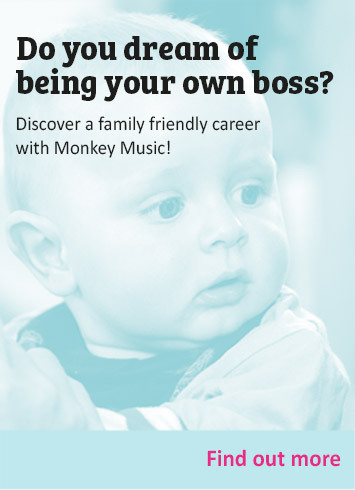 Monkey Music’s unique teaching curriculum was written by classically trained musicians as well – designed to introduce music to very young children in a way they can easily understand and enjoy. We all make full use of the lively 30 minutes to captivate the children using a winning combination of catchy music, percussion instruments, visual props and boundless energy, with lots of opportunities for the children to experiment with the instruments and make music of their own. Our children (and their grown-ups) have fun whilst enhancing development, listening, concentration, confidence and social skills. The benefits for children speak for themselves – but there are benefits for our grown-ups too, be they parents, carers or grandparents. Share precious experiences with your little ones and a whole lot of fun – meeting other parents and carers at the same time. We’ve introduced many friends for life! It’s so rewarding to see how children grow in confidence and how they learn and develop through the Monkey Music curriculum. Come along and see for yourselves! “My son has been going since he was 6 months old. He is now 4 and in his last term of Monkey Music. He absolutely loves it. This is so much more than a music class. 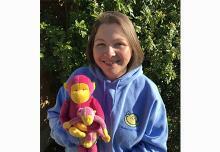 Would highly recommend it for every child"
Hello, I’m Claire and I’ve been running Monkey Music since 2005. Music has always been a big part of my life and coming from a large musical family, my home was a wonderful noisy musical place and still is. My principal instruments Vocal, Clarinet and Piano. 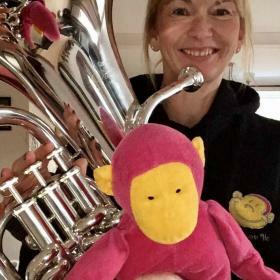 Hi, I’m Kelly and I’ve been a Monkey Music teacher since 2007. I am a saxophonist who’s been lucky enough to play in some of the UK’s most awesome venues. I have studied music at both Keele University and the University of North Texas. I also have a MA in Music Therapy. Hi, I'm Kristi I have a degree in communication arts, majoring in drama and this enables me to draw on my performance background to deliver classes with energy and skill. I am now able to combine my love of music and the performing arts with my dedication to great early year’s education. 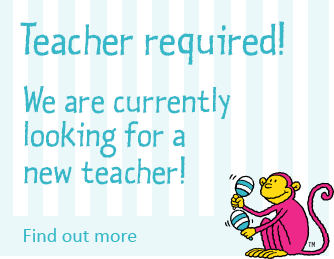 Hi, I’m Samantha, a mum-of-two and have been a Monkey Music teacher since 2011. The Euphonium is my principal instrument and compete at Championship level for the Bilton Silver Rugby Band. I believe music is so important to all of us – it’s something I am hugely passionate about. What a fabulous sunny Easter. Monkey is back on Monday 29th April at all venues across Warwickshire.